The ImageCenter ADS 2800W Desktop Scanner with Wired and Wireless Networking offers powerful features for mid to large size workgroups that help simplify the way documents are captured, managed, processed, and delivered. 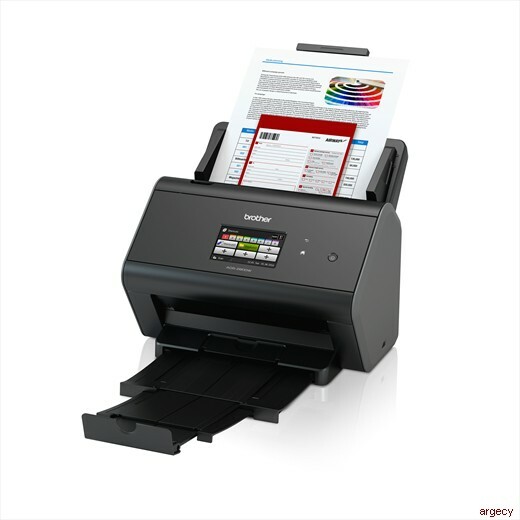 Using the 50 page capacity auto document feeder, it captures single and double sided documents in a single pass at speeds of up to 30ppm, making it perfect for scanning multi page, two sided business documents, as well as single page documents up to 196" long, receipts, business and plastic cards. With Wireless and Gigabit Ethernet networking plus Web Connect, the ImageCenter ADS 2800W offers simple PC free scanning to a wide variety of destinations, including cloud applications such as GOOGLE DRIVE, EVERNOTE / EVERNOTE for Business, DROPBOX, BOX / BOX for Business, Microsoft OneNote and OneDrive / OneDrive for Business, as well as mobile devices using the free Brother iPrint&Scan app, directly from the easy to use 3.7" swipe color TouchScreen display. The ImageCenter ADS 2800W includes a robust suite of scanning software, including OCR, PDF editing, and desktop document management programs. It is also compatible with Kofax VRS, an industry leader in image processing software that dynamically evaluates each scanned page and automatically applies the correct image quality settings for maximum output enhancement. Plus, integration with Brother Solutions Interface (BSI), which allows developers to access Brother's internal web services to create custom solutions and enhance business workflows, makes the ADS 2800W the complete scanning package for your business. >Daily Duty Cycle Maximum number of scanned pages per day can be used to compare designed durability between like Brother products. For maximum product life, it is best to choose a scanner with a daily duty cycle that exceeds your requirements. Direct Scanning Destinations Direct to cloud scanning requires Internet connectivity and account with desired service; additional purchase may be required. Evernote is a trademark of Evernote Corporation and used under license. Max. Paper Size (single sheet) Single sheet, single sided, 14 29lb bond. Media Weights For best performance, carrier sheet use is recommended for media weights under 39 g/m2. Mobile Device Compatibility Requires connection to a wireless network. See www.connectprintshare.com for details, availability, and mobile device compatibility. USB Direct Interface USB flash memory drive not included. Web Connect Requires Internet connectivity and account with desired service; additional purchase may be required. Evernote is a trademark of Evernote Corporation and used under license.